Let's Do It for ME! : Competitions Galore!! It’s May, it’s ME Awareness month and it’s time to celebrate! The Big Sleep for ME, a fundraising and awareness event in aid of Invest in ME, are getting in the party mood. They’ve lined up a whole load of fab competitions which you can take part in throughout the month. 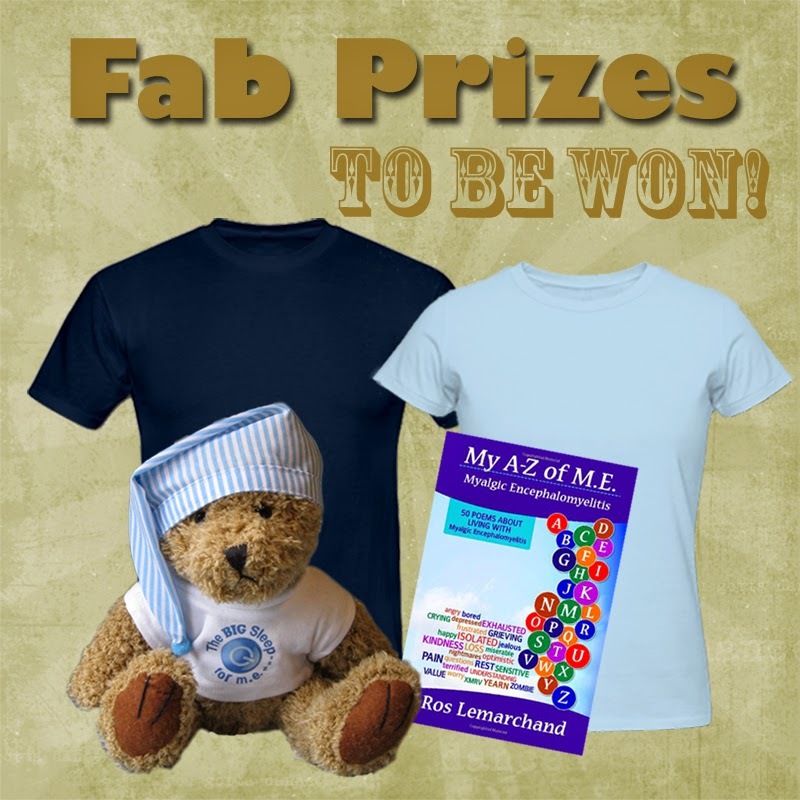 There are some great prizes to be won, including their very popular Snugzie bear, a signed copy of Ros Lemarchand’s book of poems, ‘My A – Z of ME Myalgic Encephalomyelitis’, and a chance to have your own artwork feature on their merchandise. They even have a competition especially for children. 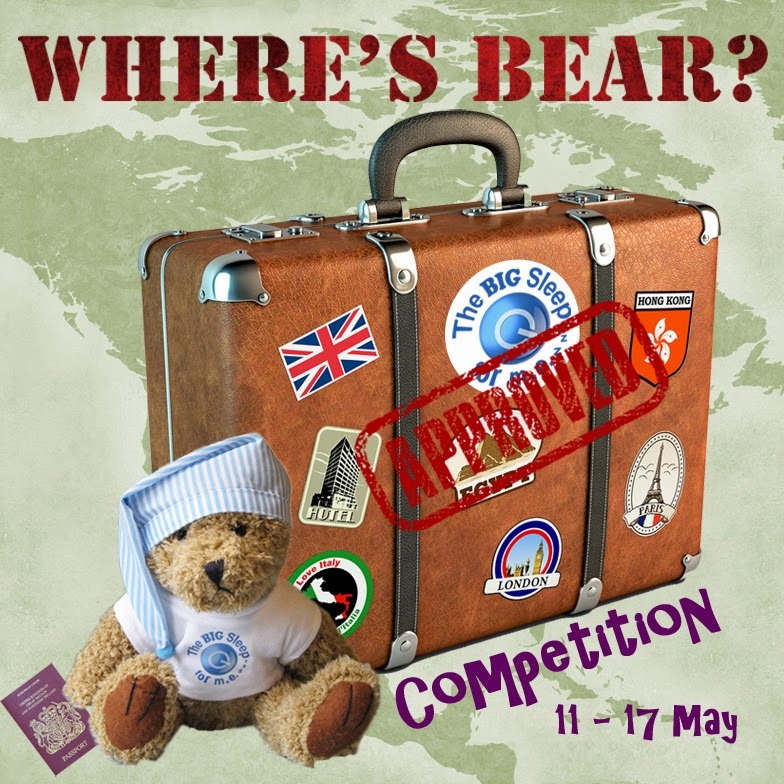 Their prize draw to win a bear is very easy to enter. All you have to do is simply register to take part here and you’ll be automatically put into the draw. You must register by 10th May to qualify. The draw will take place on 11th and the winner will be announced to tie in with the first day of ME Awareness Week and their Sleepathon. If you’re taking part in the event, you can also get your hands on one of their bears by just submitting photos to them of you taking part. They will award bears to those they consider have sent the best in. The Where’s Bear? Competition looks great fun! Snugzie will be off travelling from 11 – 17 May, to coincide with ME Awareness Week and the Sleepathon, all you have to do is say where he is. There’s a bear up for grabs each day, so there are plenty of opportunities to get your mitts on one! This is how it works; each day a picture will be posted up of Snugzie on ‘location’ on their website homepage, Facebook Event’s page and tweeted via Twitter. You then submit your answer of where you think he is by email, commenting under the picture on Facebook or replying to the tweet on Twitter. All the correct answers will be put into a draw and the winner will be announced the next day. We understand from inside information that he certainly gets around! There’s no stopping that adventurous little bear! With the next two competitions, it’s time to get creative. First up, for those budding poets out there, is the Poetry Competition. 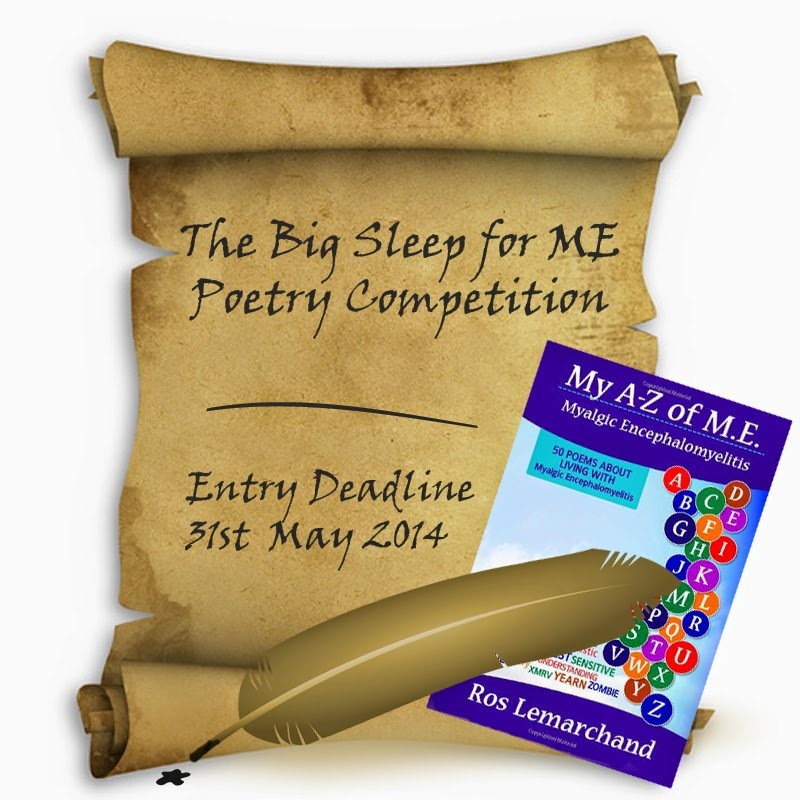 This competition is inspired by the popularity of Ros Lemarchand’s poems posted during last year’s Big Sleep. Not only does the winner get a signed copy of Ros’s book of poems, ‘My A – Z of ME’, but it’s also a chance to shine because the winning poem will be shared on Facebook, tweeted and have its own dedicated blog post. Big Sleep HQ has said that if there are a number of very good entries the number of winners will be extended. It has even been mooted; they might put together a book of the best ones. Your poem could be in print! How amazing is that?! The competition is open to anyone, but the poems must relate to ME. Just email your poems to info@thebigsleepforme.com, post them up on their Facebook Event page or even tweet them to The Big Sleep for ME. Each entrant is allowed to submit up to 3 poems and the deadline for entry is 31st May, the winner(s) will be announced on 28th June. 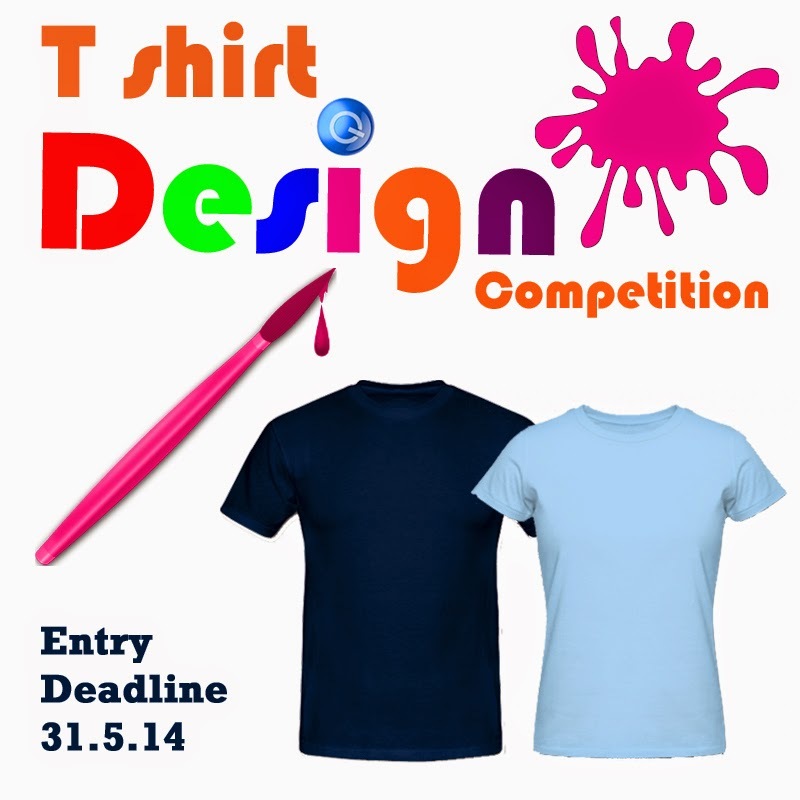 The T shirt Design Competition is equally exciting. For those with an artistic bent, just submit a design/s to feature on their T shirts and other merchandise. The design brief is pretty wide; it just needs to relate either to the event, ME or both. Be as inventive and creative as you like! The winning design will not only feature on their merchandise in their shops, but the winner will get to wear it as well! Since The Big Sleep is giving away an item of clothing of the winner’s choosing with their design on. How fab is that? The artwork must be your own , be submitted in digital format and emailed to them. For drawings and paintings just scan and send them, if you’re more into graphics and editing that’s fine. But again, it must be your own work: any elements contained which are not your own must not be subject to copyright. You are allowed to submit up to 3 designs in the following formats; JPEG, PNG, GIF, TIFF, PDF, AI, EPS. The image must be good quality and be at least 300dpi. Large files need to be zipped so they can receive them. The entry deadline is 31st May and the winner will be announced on 28th June. The Big Sleep for ME likes to be as inclusive as possible, so they’ve also got a competition especially for children. 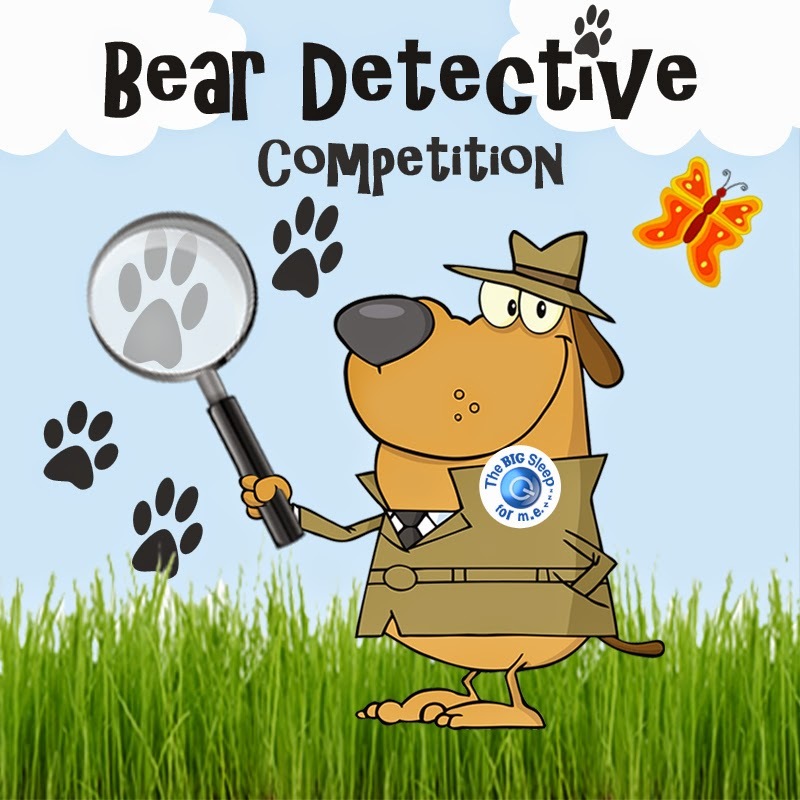 The Bear Detective Competition is a fun way for children to engage with ME. All they have to do is help Big Sleep HQ find the suspicious Big Sleep Bear by letting them know where he is and what disguise he’s wearing. He’s hiding somewhere on their website. Answers can be submitted here. Only children 11 and under can enter, with only one entry allowed per child. All children must have parental consent to enter. Deadline for entry is 16th May. All correct answers will be put into a draw and the winner will be announced on 17th, which ties in with the end of ME Awareness Week and the Sleepathon. But that’s not it! They’re also having a Facebook disco which will be announced shortly and Ros, The Big Sleep Bard, is back for 2014 with more of her great poems. It’s all happening at The Big Sleep for ME! If you want to find out more about the competitions or are interested in taking part go to their website. You can email or tweet them too.